Do your vacation plans revolve around hitting the slopes or sightseeing with family and friends? If so, we’d like to introduce you to our full-size SUV rentals. 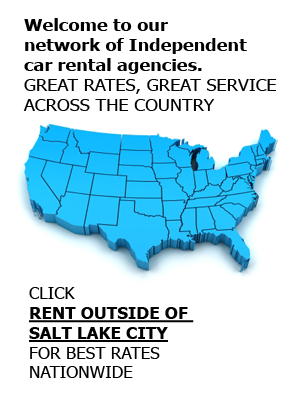 At Affordable Rent-A-Car And Sales, we provide customers with vehicles in Salt Lake City that enable them to truly embrace any vacation. Plan your next trip and reserve one of our standard SUV rentals online, or simply call us at (801) 266-7368 with your questions and reservation requests. With a full-size SUV rental, you can set your sights on an expedition into Yellowstone without worrying about elbow bumping and stiff necks. These larger SUVs come with ample leg and headroom and other amenities that you can’t find in a typical car rental. If you’re heading up the mountain for some skiing, an SUV is the best way to transport you, your passengers, and all your gear. Excellent customer service – Customers can expect the best, homegrown service in Salt Lake City. We wouldn’t be here without our customers, and we like to pay it forward. Low, competitive rates – As our name suggests, we offer affordable and always-competitive rates, so our customers can enjoy their vacation without empty pockets. Free airport pickup and drop-off services – Instead of waving down a taxi when flying into the SLC airport, customers can opt for our complimentary airport service. We will pick them up at the curb and drive them to our airport branch, then bring them back when their vacation is done. Door-to-door shuttles – If needed, our shuttle service will pick customers up from their homes, offices, hotels, or other locations in Salt Lake City and bring them to us for their car or full-size SUV rental. Smile-filled greetings – We greet all customers with enthusiasm. Along with large sport utility vehicles, we also have a variety of other Utah car rental choices, including compact SUVs, luxury SUVs, cars, vans, and pickup trucks. We even rent to production crews, and sell used cars and all other vehicles in our rental fleet. If you’re interested in any of our services or rental options, contact our main location directly at (801) 266-7368 today.